Reserve Heart to Heart Today! The only reason I gave a 5 on check out is because we feel that 11:00 am is just to early for the cost. You’re not really able to go out that last night and enjoy because of having to get up, showered, packed and be out by 11:00 am. I’m 55 and have disabilities, along with the medications I take, it’s just hard to get going that quickly and is one reason we left a day early instead of staying the last night we paid for, just so I didn’t have to be rushed. Even an hour more on check out would be helpful but 2 would be great, say 1:00 pm, I know the staff has to get in there and clean but my wife and I leave the cabin just as clean as it was except the sheets being changed, we even bring our own towels, toiletries and dish soap. Check out at 11:00 am is the biggest complaint I have and I let the office know that I was leaving early. We usually look for different cabins each time just for variety. However, we’ll be coming back to this one. Great location. Beautiful cabin. Just perfect for a quiet getaway and still close to activities. We loved how cozy the cabin felt. Especially enjoyed the fireplace and hot tub! Also, liked the convenience of the location! WE LOVED EVERYTHING ABOUT THE CABIN. WE WILL BE SURE TO TELL OTHERS ABOUT YOUR CABIN RENTALS. The bath tub plug was loose and the tub water was draining out. Light bulb in bathroom keeps blinking? Electrical problem. Other then that we loved the cabin, Fireplace, Spa, Location, We are planning to go back again. Beautiful spot for a weekend getaway! The bed was a bit uncomfortable. The location is nice and peaceful. Would more than likely refer. The only downfall is the cleaning fees. They aren't cheap but we had to clean, dispose garbage, gather towels and wash the dishes before departure. Don't like the cleaning fee then they ask you to make sure dishes are washed and trash removed. Cabin and area were wonderful. Staff at check-in was a little rude but other than that they were great. Cable in bedroom kept going in and out so that should be fixed. Even after maintenance came and fixed it, kept going out. Also the pond is catch and release only was told otherwise, and caught nothing all 5 days. Other than that it was a wonderful experience. Would definitely stay again. We loved the cabin!! Very beautiful and clean! We would recommend this cabin to everyone! No traffic, very romantic!! Check in was great! Very friendly ! Hope to come back next year in the same cabin!! We loved the cabin it was beautiful, but you couldn't sign into the Wi-Fi, bunches of spider webs above the cabinets and shower and the washing machine was broken. Don't get me wrong I would go back to this place in a minute, don't really care about the Wi-Fi or washing machine, but you're paying a cleaning fee and the cleaners are slacking. We absolutely loved the cabin. The area that the cabin is in is very nice and peaceful. Everything that is on the website is exactly as it is, nothing deceiving. The staff at check in was very nice and helpful at explaining how to get there. Had a wonderful time and will definitely be back. The cabin is in much need of a really good cleaning. There was dust everywhere. Dirt & dead bugs around the baseboards in the living room. Dead bugs & bees in the window seal in shower room. The mattress on the bed was not very comfortable as u could feel the springs in it. We have stayed with Cabins USA several times & have always been very satisfied, but this stay was a little disappointing. Would be a very nice cabin if changed mattress & did a major cleaning. Cabin was very nice. First night we had no TV in the bedroom. We figured out the cable box was not plugged to the TV so we had TV in bedroom the second night. Check-in staff acted as if we were a bother. Overall, everything was great. Love the easy check out. Heart 2 Heart was the perfect place for my new husband and I to spend a few days for a quick honeymoon getaway. The cabin was immaculate! The cabin was just a picture perfect in person as it is in the pictures, if not more so. The only little complaint we had was that we ran out of hot water filling the heart shaped tub and that we couldn't stay the entire week to enjoy the cabin comforts and relax. Thanks for a memorable honeymoon!! All was good except for the cable box in the bedroom not working, having no wifi and the bags of trash left behind the can from the prior vacationer. Thank you for taking the time to let us know about your recent stay in Heart to Heart! We here at Cabins USA work hard to make sure each of our guests have the same great stay you enjoyed while vacationing in the Smokies. Thank you for letting us know about the Cable issue and the trash. Your comments have been forwarded to the proper department to be addressed. When you are ready to stay with us again, please mention you are a return guest for an additional discount. Thank you again for your review and thank you for choosing Cabins USA! This cabin is easy to find and is beautiful on the inside and out. It is so cozy and nicely decorated. Tv's could be bigger but we will be staying here again. Heart to heart is the perfect little cabin for two people in need of a few days away. The mattress needs to be replaced and the dishes were not washed thoroughly prior to our stay, but, that aside, the cabin was just right for a brief getaway. The Cabin was very nice, just right for two people, quiet location. Had a very good experience with online booking and express checkout. Good location with easy access to Townsend and Pigeon Forge. Highly recommend this cabin to others. The cabin was beautiful. I didn't like the cabin didn't have a dishwasher and was close to a house next door but the cabin itself was amazing. The cabin was detail and decor made you feel at home. This is the perfect cabin for a couple who just wants to get away for the weekend. I would stay here again and recommend to anyone looking to stay in mountains for the weekend. Thank you for all of your kind words! When you are ready to stay with us again, please mention you are a return guest for an additional discount. Thank you for choosing Cabins USA and we look forward to having you as our guest again soon! We really enjoyed our stay. It was a well stocked cabin with all the comforts of home. Very quiet and peaceful just as we were looking for. The arcade game was a blast to play (but no sound...bummer) We were disappointed in the bedroom tv as you couldnt watch it unless you were sitting up in bed. The cabin was excellently stocked with enough towels and washrags which was a plus bc its nice to have a fresh towel everyday. Cabins USA has never let us down and we have booked numerous times. I have a cleaning company so I am a little critical on the cleanliness of places I stay (Which is totally my problem) The cabin was very clean on the surface and absolutely acceptable. Thanks for offering your cabin so many of us can enjoy it. God Bless. Thank you for taking the time to let us know about your recent stay in Heart to Heart! We here at Cabins USA strive to give each guest the best stay possible while vacationing in the Smokies. Thank you for letting us know about the lack of sound on the arcade game. Your comments have been forwarded to our maintenance department to be addressed. Thank you for choosing Cabins USA and we look forward to having you as our guest again! This was our 1st time staying in a cabin while visiting Pigeon Forge. This cabin was easy to find and not way up on a mountainside. We enjoyed the peace and quiet when sitting out on the deck. We didn't utilize the kitchen area because of dining out but it had all the necessary items it seemed. We would use CabinsUSA again if we decide to stay in a cabin again on our next visit to Pigeon Forge. Thank you for taking the time to let us know about your recent stay in Heart to Heart! We here at Cabins USA work hard to ensure each of our guests have the best stay possible while vacationing in the Smokies. When you are ready to stay with us again, please mention you are a return guest for an additional discount. Thank you again for your review and thank you for choosing Cabins USA! Everything was great. The only complaints being the wife said the bed was kinda uncomfortable and there isn't much room around the hot tub to get the cover off very easily and putting it back on. I am 6' 6" and struggled to get the hot tub cover back on. The timer switch in the living room for the fireplace does not work. You have to use the one in the bedroom. Other than those couple things...everything was great. The arcade game was a huge plus also. We stay here at Heart to Heart Dec. 2 thru the 4th. Absolutely loved the cabin and location, it was peaceful and enjoyed the privacy of the hot tub. We can't wait to get back the Great Smoky Mountains. We will be booking with CabinsUSA from now on. I am so happy to hear that you enjoyed your stay in Heart to Heart! We here at cabins USA work hard to make sure each of our guests have the same great stay you enjoyed while vacationing in the Smokies. When you are ready to stay with us again, please mention you are a return guest for an additional discount. Thank you again for your review and thank you for choosing Cabins USA! Pretty much everything was great, however, there are some glitches. I feel like the place needs cleaned better; especially under the bed. Also, I'm not sure if anyone goes through the kitchen cabinets but there was old bread and crackers in the cabinet that were opened...kinda gross. The fireplace was nice but is glitchy. Sometimes the one switch would work and the other wouldn't; sometimes it took a bit to turn on. Other than those three things, I really liked the place and it was nice; I especially liked that it wasn't directly on the strip as it can get busy at times. A very cozy place, very relaxing. Thanks! I am so happy to hear that you enjoyed your stay in Heart to Heart! When you are ready to stay with us again, please mention you are a return guest for an additional discount. Thank you for choosing Cabins USA and we look forward to having you as our guest again! Thank you for all of your kind words! When you are ready to stay with us again, please mention you are a return guest for an additional discount. Thank you for choosing Cabins USA and we look forward to having you as our guests again! Thank you for all of your kind words! We here at Cabins USA work hard to make sure each of our guests have the best stay possible while vacationing in the Smokies. When you are ready to stay with us again, please mention you are a return guest for an additional discount. When you are ready to stay with us again, please mention you are a return guest for an additional discount. Thank you for choosing Cabins USA and we look forward to having you as our guest again! We stayed at Heart to Heart for our first year anniversary and we both loved it! This was our first time using Cabins USA and we were amazed with how easy the booking and the check in was. The cabin was very cozy and extremely clean and we were very comfortable throughout our entire stay. 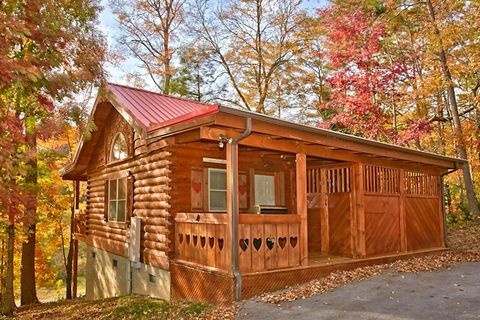 This cabin is only a couple of minutes away from the main strip in Pigeon Forge. So, we felt secluded, but close enough to all of the action of the city. I would definitely recommend this cabin to anyone who wants to have a romantic couples get away. I will be using Cabins USA again in the future! We absolutely loved this cabin and will more than likely stay here again in the future! Thanks! We had an awesome time! I am so happy to hear that you enjoyed your stay in Heart to Heart! When you are ready to stay with us again, please mention you are a return guest for an additional discount. Thank you again for your review and we look forward to having you as our guest again! We stay 2 night and 3 days, it was an awesome cabin, we were very pleased! Great location and more than satisfied! Thank you for all of your kind words! We here at Cabins USA work hard to make sure that each of our guests have the same great experience you enjoyed while vacationing in the Smokies. When you are ready to stay with us again, please mention you are a return guest for an additional discount. Thank you for choosing Cabins USA and we look forward to having you as our guest again! Loved the stay at Heart to Heart cabin. Was very impressed with the decorations and cleanliness. Would love to stay there again. Hopefully will be able to . I am so happy to hear that you enjoyed your stay in Heart to Heart! Our cleaners work hard to make sure that each of our cabins are thoroughly cleaned so all our guests have to do is walk into their cabin and start relaxing. When you are ready to stay with us again, please mention you are a return guest for an additional discount. Thank you for choosing Cabins USA and we look forward to seeing you again soon! Very happy with our honeymoon stay. The cabin was just as it was stated on the website and very clean. Location was perfect... A short drive to pigeon forge yet not too close to the hustle and bustle of the city. Would highly recommend Express Check in. It made the check in and check out process ridiculously easy. Thank you for choosing Cabins USA to spend your honeymoon! Our housekeepers work hard to make sure each of our cabins are thoroughly cleaned and fully stocked so all our guests have to do is walk into their cabin and start relaxing. Thank you again for choosing Cabins USA and we look forward to seeing you again soon! We really enjoyed this cabin. Easily accessible and close to Pigeon Forge. This was our first time using Cabins USA and will definitely rent from them again. Cabin if great for just couples Thanks for a great a stay. Thank you for all of your kind words! We here at Cabins USA work hard to make sure that each of our guests have the same great experience you enjoyed while vacationing in the Smokies. When you are ready to stay with us again, please let our reservationists know you are a return guest for an additional discount. Thank you again for your review and we look forward to having you as our guest again! We were very impressed with the cabin! It was secluded and very peaceful! The layout of the cabin utilized every amount of space. You had everything you needed for a romantic get away. Loved the heart shaped bath tub!! We had read a review that said there wasn't sufficient hot water, but that was not the case. The arcade game fit our generation perfectly. My husband fished the lake every morning while he was waiting for me to wake up. This cabin met our needs in every way! It was very close to the main street, but was secluded enough to make you feel as if you were alone in the mountains. We would love to stay here again!!! Thank you for all of your kind words! The owners of our cabins work hard to make sure that our guests have everything they need to make their stay the best possible. When you are ready to stay with us again, please let our reservationists know you are a return guest for an additional discount. Thank you again for your review and we look forward to seeing you again soon! This was a last minute get away and we were very pleased. This cabin was great and the location was great also. Not too far out but out far enough to be away from the mean stream of things . Couch could have been a little more comfortable and the shower door needs to be fixed or replaced but other than that it was very nice. Check in was wonderful and check out was simple. Would recommend this cabin and Cabins USA! I am so happy to hear that you enjoyed your stay in Heart to Heart. We here at Cabins USA work hard to make sure that each of our guests have the same great stay you enjoyed while vacationing in the Smokies. Thank you for letting us know about the couch and shower door. Maintenance has been notified and will be working to get those issues corrected. Thank you again for your review and we look forward to seeing you again soon! This cabin was so amazing! I was 100% completely satisfied with both Cabins USA and the Heart to Heart cabin! We chose the Heart to Heart because we were visiting for our honeymoon, and it looked like the perfect romantic spot! We were not disappointed!! We pulled in to check in and the parking lot was full. I was anxious to get to the cabin and was expecting it to take forever. We walked in, and less than 15 minutes later were on our way! Check in was super easy and quick, and the staff was wonderful. We got to the cabin, and I immediately fell in love!! It was beautiful, well kept, and very clean. We had just about everything we needed. If you are a coffee drinker, bring your own coffee filters. That was about the only thing not provided. The hot tub was amazing! The hubby loved the arcade games. We actually didn't have a chance to try out the jacuzzi tub, but will definitely have to do that next time! We had neighbors, but they aren't super close. There is plenty of privacy and it was very quiet and peaceful. We loved our time in Pigeon Forge and will definitely be returning as soon as possible! We will be using Cabins USA to book our next cabin, and would love to stay at the Heart to Heart again! Thank you for all of your kind words! Our guest service agents work hard to make sure that each of our guests experience a fast and friendly check-in and are sure to answer any questions our guests may have. When you are ready to stay with us again, please let our reservationists know you are a return guest for an additional discount. Thank you for choosing Cabins USA and we look forward to seeing you again soon! We have stayed at a lot of cabins over the years. This was one of the cleanest, best maintained we have seen. We will use you again. Thank you so much for all of your kind words! We here at Cabins USA work hard to make sure that each of our guests have the same wonderful stays you experienced. Please feel free to contact one of our reservationists when you are ready to start planning your next trip to our area. They are always more than happy to help our guests find the perfect cabin. Thank you again for your review and we look forward to having you as our guest again! Our honeymoon experience at heart to heart was phenomenal we would and have recommended cabins USA to our family and friends. We felt at home in a private community less than ten minutes away from the pigeon forge strip. We can't wait to go back! Thank you for all of your kind words and thank you for choosing Cabins USA to spend your honeymoon! We work hard to make sure that each of our guests have the same memorable stay you did. Please feel free to contact one of our reservationists when you're ready to make your next reservations. They are always more than happy to help each of our guests find the perfect cabin. Thank you again for choosing Cabins USA and we look forward to having you as our guest again! My husband and I celebrated our one year anniversary in the Heart to Heart cabin. We absolutely loved it. I would recommend to everyone. The check in and check out was easy. We was only minutes away from everything. We will be coming back. I enjoyed the a heart shaped Jacuzzi. The outdoor hot tub would not heat up for the first 2 days of our stay, bit we called Cabin USA and they came right out within minutes to fix it. We loved it!! As always our stay at Heart to Heart was wonderful! The cabin is cozy, homey, very relaxing. It is always exceptionally clean and well taken care of. The back porch is very relaxing and quiet, you feel like your in the woods. The lake is right across the street. The hot tub is great! Very clean and well kept up, also very private. The grille is always very clean also. This was our second visit to this particular cabin and will continue to be our cabin every time we return. Whoever owns this cabin must take a lot of pride in it . It really shows in every aspect. Thank you Heart to Heart we love you!!! See you again soon!!! Oh and bye the way the Pacman and Galaga video game is so much fun too!! Was nice and quite and clean. Needs a new grill though burners are messed up and the timer for the gas for the grill was broken. Other than the grill very nice cabin. I recommend you all the time to people who ask where we stay when we come to pigeon forge. I have been renting cabins from you for years. the cabin heart to heart is so peaceful . Great location, we loved the cabins fireplace, hot tub, view, very cozy and comfortable. Kitchen could use more than one towel. Hot tub could use some sort of stand to place drinks on. We had an amazing stay here and enjoyed the Pac Man machine, not only that but the pizza place that's right up the street from the cabin. We also enjoyed the location of the cabin in relation to the strip, it took us less than 5 minutes to get to where we needed to go but the comfort levels were amazing! The only thing I would fix is the one of the shower heads in the bathroom, its a dual shower but only one shower head works and when you have to switch off in the shower it kind of defeats the purpose of a dual shower. Also when filling up the Jacuzzi with water, the hot water won't stay hot coming from the faucet. I also recommend putting the tv at an angel because the screen obtains a shadow in the image and is hard to see when laying down. I suggest getting a wall mount that allows the viewer to adjust at any angel they choose. If you test the angel of the tv and push the top part away from the wall and put something under the stand in the back half the picture quality changes perfectly making it 100% able to watch without hassle. Now there's nothing wrong with the image or tv its a flat screen tv w cable, I'm just saying if i came here again I would like to see this stuff happen. It will last for about a minute then slowly starts to get cold. Other than that everything else is amazing! Thank you for taking the time to review your stay with us. We appreciate all your feedback. We will have our maintenance department address the concerns that they are able to that you have presented to us. We are always looking for ways of improvement, so again we appreciate your time that you took to leave your review. We hope that we will hear from you again soon, and do not forget to call us about our return guest discount. This cabin is great. We'll definitely be returning back to this cabin and Cabins USA in the future. Heart to heart was wonderful. It was a nice location, far enough off of the main drag to not hear the business but close enough to get to everything. It was private but not secluded. We didn't hear or see neighbors. My husband fished the pond, but not long enough to catch anything but there was definitely fish in there. We used the hot tub and Jacuzzi. Hot tub was great but Jacuzzi wouldn't fill the whole way with hot water, half way the hot water ran cold. Pilot light wasn't on for the fireplace but we called maintenance and he came over that evening and turned it on so we could enjoy it. The sheets, comforter and towels were clean and the bed and couch were comfortable. Our stay at heart to heart was lovely. I would stay again in this cabin. The Heart to Heart Cabin rocked! It's perfect for a quiet weekend with your lovebug. My wife and I enjoyed this very much this was our 25th anniversary and the cabin was excellent along with the ease of the arrangements and the check-in was very easy . We would highly recommend Cabins USA , this will be our first choice for our next trip to the Smokies. The cabin was wonderful; so well kept and clean. We had a great time. We absolutely loved, loved, loved, Did I say LOVED Heart to Heart cabin? It was the coziest cabin we have ever stayed in. It was very clean , it had everything we needed and more. We loved the hot tub, that was a nice perk in renting the cabin. It was very quiet and relaxing . The lake was nice, my husband fished in the morning he really enjoyed that. The location was great not to far from anything at all. The fireplace was very nice also. The bed was very comfortable not always the case when you rent. My husband and I are looking forward to our next little getaway, we absolutely are going to come back to Heart to Heart cabin!!! Also dealing with Cabins USA has been a great experience, we have stayed at other cabins and everyone we have dealt with has been very helpful, always willing to go above and beyond if they have to . We are staying in another cabin in Sept. for a full family vacation and they were very helpful with that arrangement also. Book with Cabins USA and you won't be sorry!!! Beautiful clean cabin good job and well done with housekeeping. Couch could be replaced for it has been worned out its cushions, jets in jacuzzi and hot tub could be cleaned out for the jets to do a better job, other than that its a beautiful location, peaceful, relaxing place to stay. Thank you for your review. We are glad you enjoyed staying with us at Heart to Heart. We apologize for any inconveniences or discomforts and we appreciate your opinion. We hope that you will choose Cabins USA for you next trip to Pigeon Forge, TN. Thank you for your business Deborah, it is greatly appreciated. We are delighted the we are always able to provide you with an amazing stay away from home. Right now we currently do no have loyalty program, but is something are planning for the future; however, we do send all of our return guest all our promotions we offer yearly. We hope we will see you again soon. Please let us know if you every have any concerns or questions. We went up for our second honeymoon. We were extremely pleased with Cabin life for a week, it felt like it was our home, it was very homey. Everything was exactly how it appeared in the video, there were no exaggerations. It was Extremely clean, Peaceful, Relaxing, Very private, and Felt very safe. The gas fireplace was awesome; just turn it on when you need it, no work involved, it kept the whole cabin warm, even being 20-35 degrees outside. There was lots of HOT water to enjoy between the Hot tub, Jacuzzi, and double shower. Just a far enough drive from town, but not too far to get supplies at the local stores. My husband really enjoyed the video game, which happened to be his favorite one from back in the day. Which If I may say; he beat all the previous scores, lol. Our cell phones didn't work in the cabin, but they did work on certain areas on the front porch; which worked fine for us. We found everything in good working order, even has a washer n dryer to help a lot. The staff was very kind and helpful for every question we had, and we had a lot, lol. This was the first time we ever stayed outside of a Hotel; and from this experience, we never want to stay in a Hotel "ever again". I want to personally thank our staff contact for everything! With her help, this vacation will stay in our memories for a very long time. Our stay in the cabin and in Tennessee is something we will cherish forever. It was like a dream come true and something we did not want to wake up from. Thank you so much for the once in a lifetime experience! We definitely want to take advantage of Cabins USA again in the very near future. Our stay in Heart to Heart will stay close to our hearts always. Bring your own memory foam!! Everything was perfect except the bed. Heart to Heart is such a cute cabin with a great location. Cozy and nicely furnished. Everything worked and was clean. The staff were friendly and professional. We did have an enjoyable time but a good nights sleep would have completed our experience. Everything was perfect, just as advertised. Thanks for the very nice cabin. We needed a relaxing vacation and this cabin was perfect. Not too close to town but not too far out either. Perfect, Perfect, Perfect. We love love this cabin it was so clean and cozy perfect for a romantic get away . You feel like your miles away from anyone . We have stayed with cabins USA for years now and this is our favorite cabin of all time . I can not wait to book this again . It is soo private and you can relax and forget about the world . It rekindle our love for each other after 11 years that is for sure. Thank you for sure a wonderful cabin. We enjoyed our stay. The cabin was beautiful. The location was great. We would stay again. We loved the cabin! It was clean. Loved the area. Hopefully next time we come we can it will be warmer weather so we can enjoy the porch. My Aunt passed away on this trip while we were there and when I called to see about getting another a discount to come back in case we had to leave for the funeral, the office was very nice about it. Did not have to leave early but appreciated knowing they would work with us if we did. I gave a 6 for cleanliness only because we didn't have an "out of the way" area for our luggage and so we wanted to put stuff under the bed. It was nothing but cobwebs and dust. Most of the dishes we went to use we really dirty (lipstick etc.) so we had to wash them before we used anything. And the last item was the washer detergent comparment and the rubber seal were just plain gross. Those are just items that need to be wiped out. I know the washer isn't that important, but if you see that when you go to do a load of wash well it kinda turns you off. Those are minor in comparsion really to how much we enjoyed ourselves. Any I would probably recommend the company and property to others. It was our first time in a cabin like this and I'm sure we will be back. The only problem we had was no phone service. Our cell phones didn't work because of the location (wich we understood), but when we needed to contact the office (we had trouble getting the TV to start .... Our fault. We don't have that kind of a set-up at home). We had to drive to the office. When the man came to help us with the TV, he explained that the phone was just for emergencies, and that was the responsability of the owner. We have never had any problems with Cabins USA. The Cabin was very nice. I loved the swing on the porch. We really enjoyed our stay in Heart to Heart on the weekend of May 11th. The cabin is only about a 5 minute drive to the main strip where everything is located. One suggestion I would recommend to anyone staying here is: If you are going to use the hot tub, turn the heat up as soon as you arrive at the cabin. It took a good 5-6 hours to reach a good hot temperature. My only complaint about this cabin would be the water pressure in the shower. The shower has 2 shower heads, but it is obvious that it does not have enough water pressure to push through both shower heads. One shower head as low flow coming through it, while the other just trickles water. It would work a lot better if they just made this a single headed shower. Other than the shower head complaint, we had no issues with the cabin and would definetly stay in this cabin again. You feel as though you are miles away from everything, however it only takes a couple of minutes to get to everything. The cabin is very clean and has HD TVs in living room and bedroom. Biggest problem is the cabin said Internet but it didn't work. The phone was also not working. My husband and I make a trip to the mountains every year and choose a different cabin through Cabins USA. This year we chose "Heart to Heart:. It was absolutely beautiful. We spent four wonderful days there. Terrible tornadic storms even came through and we still felt very safe. The cabin is great for a couple. The bed was very comfy and we loved the double shower heads in the shower. We would love to stay here again! A very loving and cozy atmosphere. We loved the town, people and the shopping. It was the best Valentines I have ever had. Hope to see you again next year. A very special thank you to Mark and Pauline for sharing their love nest with others. Thank you for choosing Cabins USA. We are happy to see that you enjoyed your stay. We hope that you stay with us again soon. We loved our experience in the Smokey Mountains! The cabin was close to all the attractions, but once in the cabin it felt like we were miles away. The only negative was our phone didn't work in the cabin and there was no cell service, so if we had an emergency I don't know what we would have done. Wi-fi would be something to consider getting put into the cabin, however it was nice to have nothing else to focus on but each other during our honeymoon. We LOVED the fireplace in the cabin. We would definitely come back!! The cabin was beautiful and perfect for our honeymoon! thank you so much! We celebrated our 25 yr wedding anniversary there, Very nice and private . I would recommend it to all my friends.